I've said it before but I'll happily admit to it again: I have always had a sweet tooth and I still do. Candy, chocolate and any other sugar are my weakness, no doubt about it. Since I know all too well what happens when I have even a little too much (dentist visits and elevated numbers on the scale), I try to avoid bringing it into the house at all during the week. I always indulge with a little something over the weekends though to calm the craving and avoid spinning out of control. This has always worked really well for me and when the weekend food planning rolls around I get excited to bake up some new and interesting deserts as a treat. The company Manischewitz recently debuted an array of new products, expanding on their gluten-free line as well! I think it is fantastic that they are committed to creating some healthy and delicious products that have a good source of fiber, are low in sodium and do not contain sulfites, msg or artificial preservatives. I was pleasantly surprised when they offered to send me some samples of their products to try for myself and I was pretty impressed with almost every item I recieved, two of which I am featuring in this recipe today. 1. In a large bowl, combine the flour, sugar, cocoa, baking powder and salt. 2. In a separate bowl combine the water, eggs and vegetable oil and then add the wet mixture to the dry ingredients and stir very well to combine it all into a thick batter. 3. 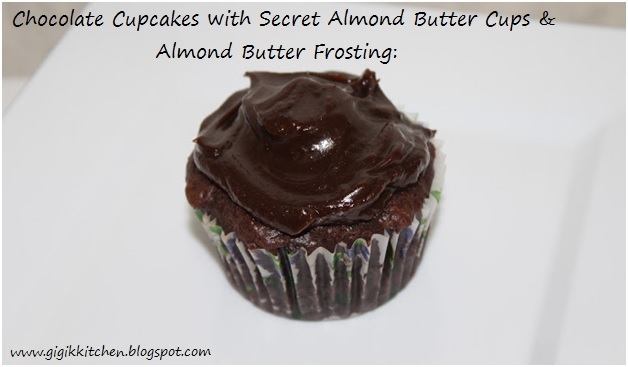 Fill paper lined muffin tins to about 1/2 full with the batter and place a chocolate almond butter cup in the center. Cover each one with about 1 tablespoon more of batter. 4. Bake them on 350 for about 18-22 minutes or until a toothpick inserted near the center comes out clean. Cool for about 5-10 minutes before serving or allow to cool completely for a less runny inside. 5. Prepare the frosting- put the baking chocolate, vanilla almond milk and roasted almond spread into a medium sauce pan and stir over a low-medium flame until they are all completely incorporated and seem like a thick frosting consistency. Allow it to cool for about 10 minutes until it is thick enough to spread. 6. Spread the frosting over the cupcakes and then sprinkle with additional broken up chocolate almond butter cups if you would like. Let them stand until the frosting sets and serve. What do you like to indulge in when you do? Chocolate? Candy? Cake?